When Star Wars: Galaxy’s Edge was announced, fans wondered if they would serve Blue Milk — which they will. And another common question is, will the remote outpost on Batuu offer any Earth beverages for anyone who doesn’t want to sip on some alien milk or funky green drink? And how would you even serve Earth beverages in a completely immersive themed land like Batuu? We now have an answer. Learn more about the Aurebesh Coke products after the jump. 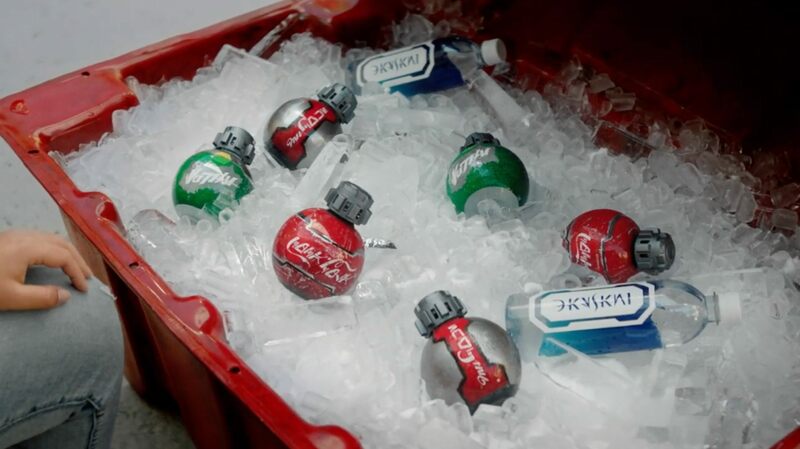 During a presentation at Star Wars Celebration 2019, it was revealed that Disney has worked out a deal with Coca-Cola to bring its products to a galaxy far far away. But don’t worry, it won’t break the theming of the land — the products will come in exclusive, unique packaging with Aurebesh writing, the common alien written-language found all over the Star Wars Universe. 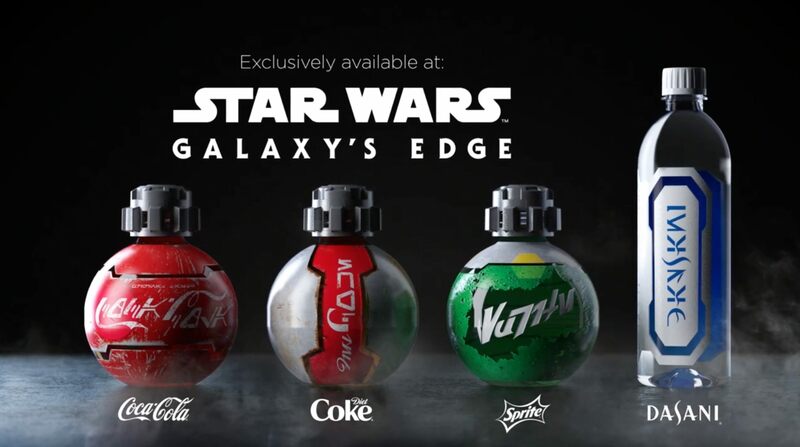 The bottles themselves are not the typical trademark coke bottles either, but a unique shape just for Galaxy’s Edge. To me, it looks kind of like the mashup of an old school Christmas ornament and a grenade. That’s no mistake as the design was inspired by the look of the Thermal Detonators in Star Wars. My only concern is that the new shape might fit substantially less soda than the typical 20-ounce design, especially with theme park pricing being as high as it is already. Matt Cooper: As you know, Coke and Disney enjoy a tremendous partnership. One of the reasons for that is we share a lot of attributes [with Star Wars], one of the most important ones is the ability to inspire moments of happiness and magic in people’s lives. With Galaxy’s Edge, we knew we had to do that in a way that was authentic to Batuu. We translate the Coca-Cola logo into 100 languages, but now we are being able to share them for the first time in Aurebesh. Brad Spickert: We saw that a lot of the things in Batuu were reclaimed, restored, it was these metals that were sorta scraped and tattered. So we wanted something that almost appeared, like it was pulled off a ship, or was left behind, and was repurposed as something to consume some of your drinks in. But all the while, we wanted to add some visual cues that it was something you wanted to consume, but not so much that it would pull you out of the storyline and back in reality. The post First Look: Aurebesh Coke Coming To ‘Star Wars: Galaxy’s Edge’, Served In Reclaimed Thermal Detonator Packaging appeared first on /Film. January 20, 2018 at 3:00 PM Theme Park Bits: $1,000 Universal Bonus, Four Houses of Hogwarts Light Up a New Castle, R.I.P. Epcot Monorail?